In a long overdue effort to provide up-to-date content not specific to one ballpark review, I will be writing more blog style articles in 2018 consisting of news, features, rankings, comparisons, special profiles, and more. I’ve realized long 10-15,000 word in-depth reviews simply aren’t optimal for dispensing, consuming, and sharing information in today’s social media environment, although such long-form ballpark reviews will continue to be released for those who enjoy the depth of the analysis. I hope you guys enjoy a more rapid stream of pithy and accessible original content this year. Spring training presents a wonderful opportunity for families with children to see a baseball game. With the average cost of attending a Major League Baseball game for a family of four over $155, spring training can be a great time to create lasting baseball memories with your family at more affordable prices. In the last 15 years or so, spring training ballparks have become more holistic family-friendly experiences. Gone are the days of scouts and baseball fanatics sitting in wooden bleachers for 9 innings at a time for the sole purpose of seeing their team prepare for the season. Like the Major League ballpark experience, these games have become family outings. Baseball isn’t dying, at all, so we should put that myth to rest, but it is aging. With an average age of the baseball fan being 57, compared to 42 with basketball, creating memorable ballpark experiences for youngsters of all ages is vital for the continued viability of the game. Let’s be honest: most kids aren’t going to want to watch the game for nine innings, so fan-friendly diversions are welcome. Ballparks are about creating memorable experiences for kids so they’ll be enticed to come back when they’re older and enjoy the game. Below are my rankings of the most kid-friendly ballparks in both the Cactus League (Arizona) and the Grapefruit League (Florida). This is a minor component in our ratings system, only worth a maximum of 2 points. But all of these ballparks are so good overall, so the smallest thing can make a difference. Not every spring training ballpark is ideal for kids who may not want to watch the game for nine innings. Those ballparks not ranked do not have any kid-friendly features other than watching the game. As I wrote here, the Cactus League generally has a stronger showing in this department, but the Florida ballparks have some nice diversions for the kids too. 1) Publix Field at Joker Marchant Stadium (Detroit Tigers): The 2017 renovation to Tiger Town probably added the strongest kids’ area in Florida. While there is no mini-wiffle ball field like the best kid-friendly parks in Arizona, Publix Field has a number of unique diversions. 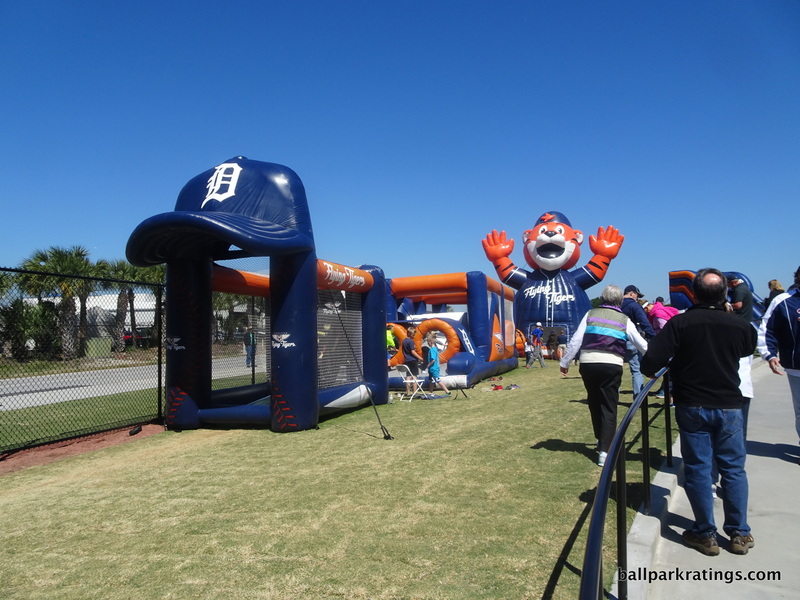 Anchored around a number of inflatable attractions, the play area has inflatable slides, inflatable tubes, speed pitch, a throwing game, and most notably, a 27-foot inflatable Tiger bounce house. 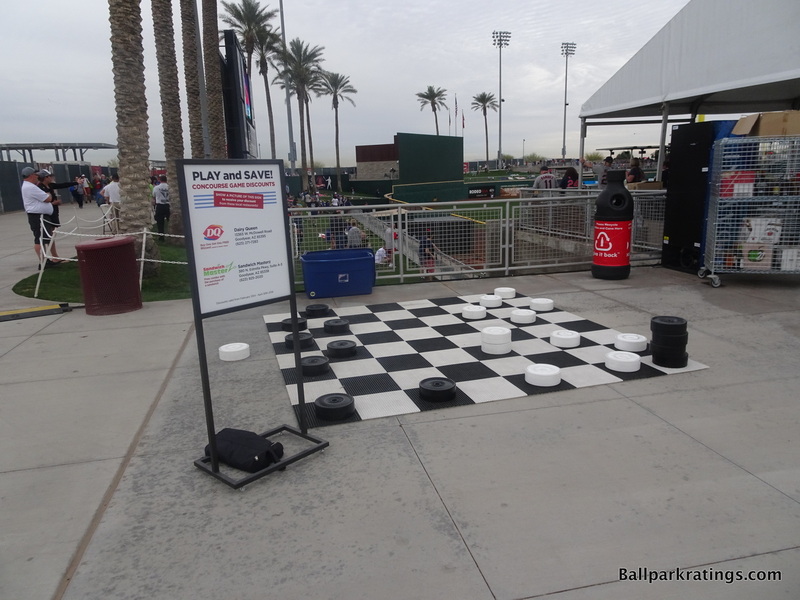 Most of all, there are some interesting activities for adults too on the runway concourse in left field, including checkers! Like a number of Cactus League parks, there is a corn hole game as well. Play area at Publix Field at Joker Marchant Stadium. 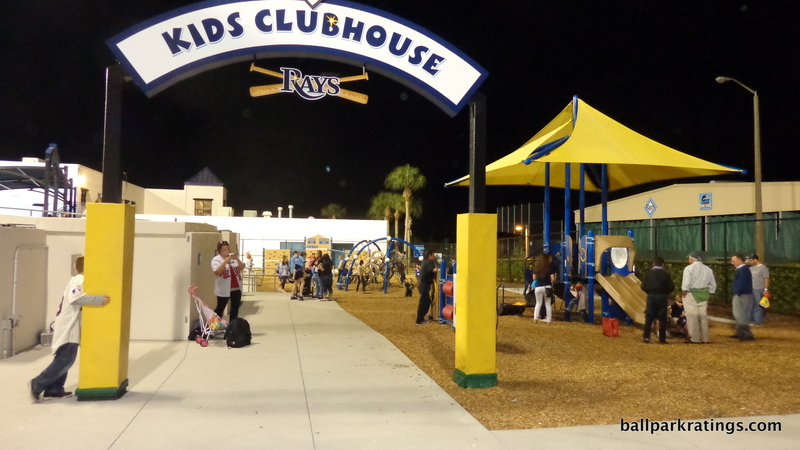 2) Charlotte Sports Park (Tampa Bay Rays): The “Kids Clubhouse” here has a slight edge over a similar set up at Spectrum Field below. 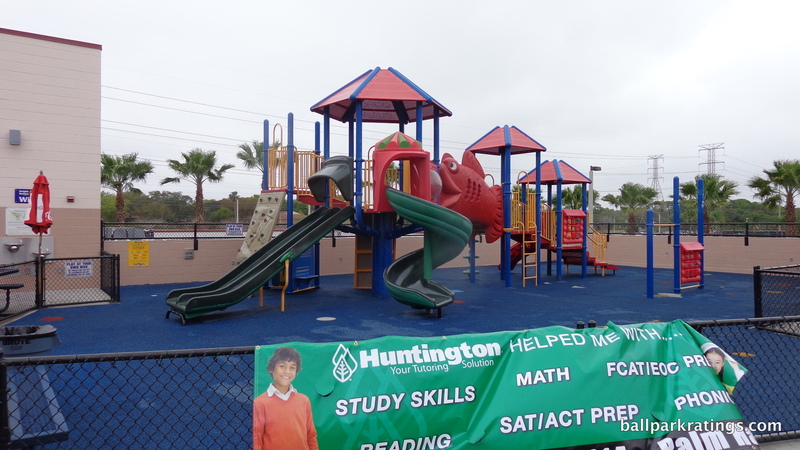 The traditional playground features a small set of slides, hoops, a jungle gym, and a mini-rock climbing wall. 3) Spectrum Field (Philadelphia Phillies): Introduced by a Philly Phanatic statue, Spectrum Field features a pretty traditional set of slides and bars, most notably connected by a fish. 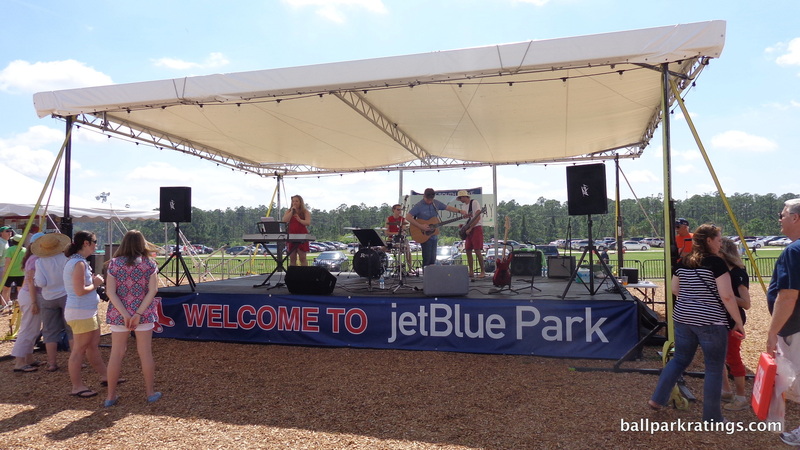 4) JetBlue Park (Boston Red Sox): In the past, Jetblue Park has had a speed pitch game and a concert stage. 5) LECOM Park (Pittsburgh Pirates): The Pirates’ park features a speed pitch game and corn hole. 6-8) First Data Field (New York Mets), Hammond Stadium (Minnesota Twins), Steinbrenner Field (New York Yankees): These parks just have a simple speed pitch game. 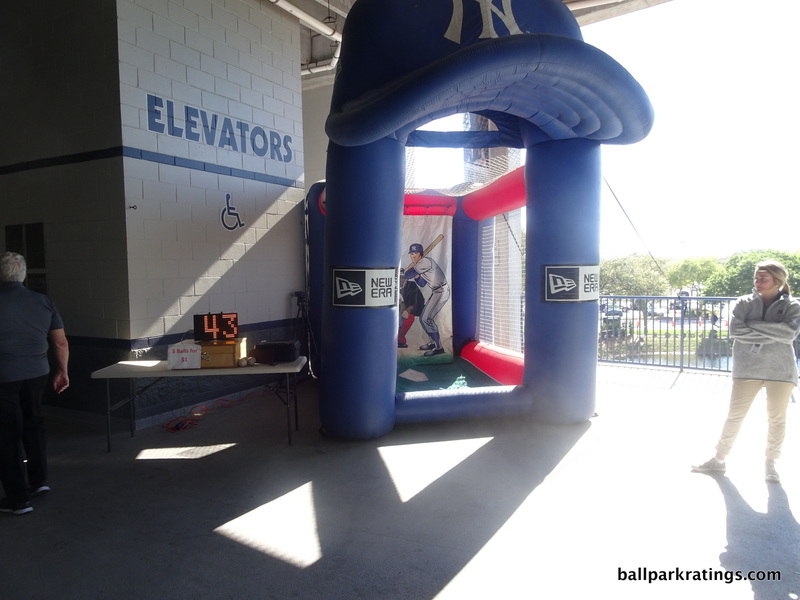 Example of a simple speed pitch game at Steinbrenner Field. The following parks do not have any kid-friendly features, at least as of 2017: FITTAM Ballpark of the Palm Beaches (Houston Astros and Washington Nationals), Roger Dean Stadium (St. Louis Cardinals and Miami Marlins), Ed Smith Stadium (Baltimore Orioles), Dunedin Stadium (Toronto Blue Jays), and ironically, Champion Stadium at Disney World (Atlanta Braves). With multiple parks sporting mini-baseball fields for kids, the Cactus League exhibition is quite impressive. 1) Peoria Sports Complex (San Diego Padres and Seattle Mariners): This is by far the most kid-friendly facility in all of spring training, taking the best from all of the ballparks while crafting such features with their own unique design vision. We have not one, but two wiffle ball diamonds on the main concourse, which is pretty incredible if you think about it. 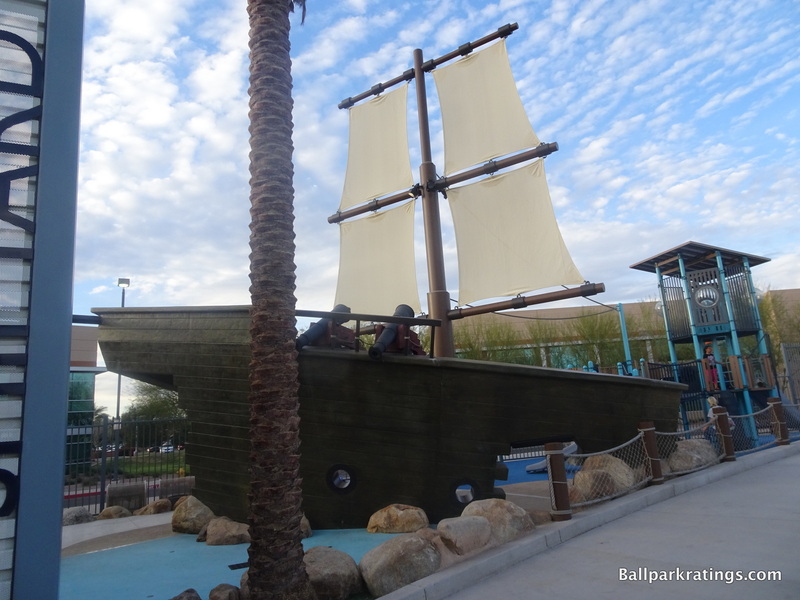 Taking a page from the common playgrounds seen at other spring training facilities, Peoria Sports Complex recently added “The Shipyard” playground, presumably a play on the Padres and Mariners’ nautical theme. It’s a pretty elaborate setup down the left-field line. Finally, Peoria also includes the standard speed pitch game and batting cages. The Shipyard at Peoria Sports Complex. 2) Goodyear Ballpark (Cleveland Indians and Cincinnati Reds): The Reds and Indians’ facility is a huge beneficiary of an ample amount of space in the corners of the ballpark footprint. In the right field corner, there is a mini-baseball diamond and a number of kids’ games, including speed pitch, batting games, and throwing games. One upping the Tigers’ setup in Lakeland, there is a set of large checkers in the left field corner. 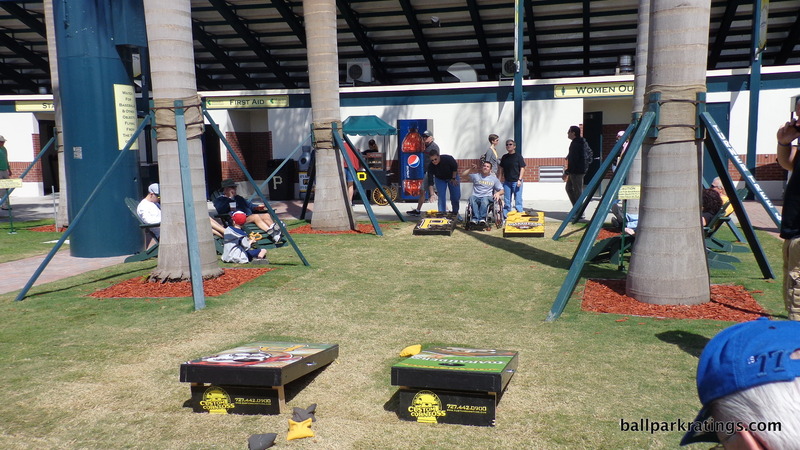 During games with high attendance, Goodyear brings in a set of corn hole games. Finally, the park has a large “Jenga” set. 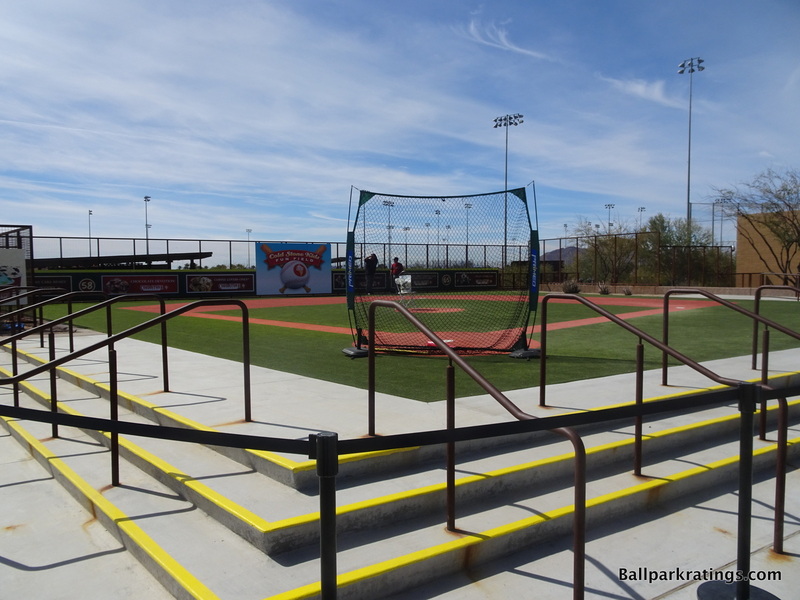 3, 4) Sloan Park (Chicago Cubs) and Salt River Fields at Talking Stick (Arizona Diamondbacks and Colorado Rockies): Both parks feature wiffle ball diamonds similar to the ones found at the aforementioned parks. For the record, I’d give these two the edge over #2 and #3 in Florida. Wiffle Ball field at Salt River Fields at Talking Stick. Peoria Sports Complex, Sloan Park, and Goodyear Ballpark also have these. 5) HohoKam Stadium (Oakland Athletics): While not as impressive as the aforementioned playgrounds, the A’s renovated park has a nice area called the “Stompers Kids’ Zone.” HohoKam Stadium also has the best speed pitch I’ve seen in spring training, which records the speed of each girl and boy in different age groups and announces the winner toward the end of the game. 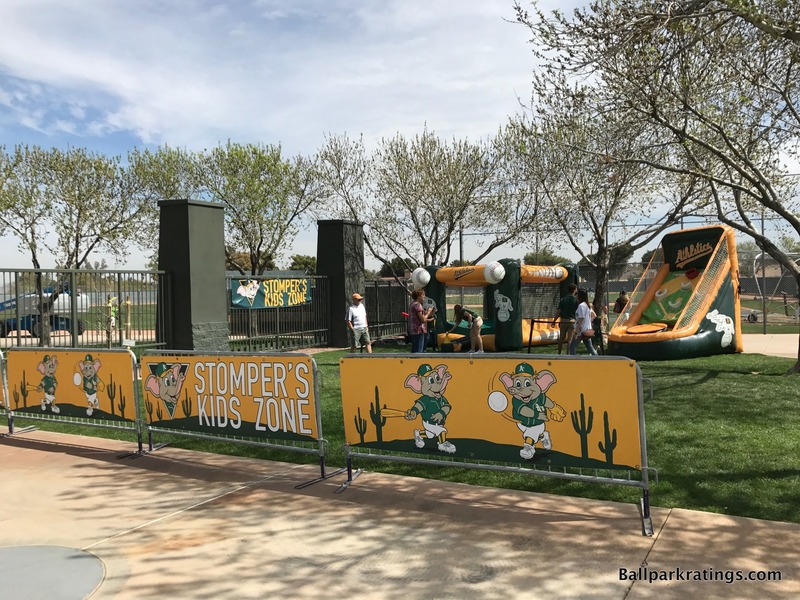 Stomper’s Kids Zone at HohoKam Stadium. 6-7) Camelback Ranch (Chicago White Sox and Los Angeles Dodgers) and Scottsdale Stadium (San Francisco Giants): Both parks feature a simple speed pitch game and a batting cage. 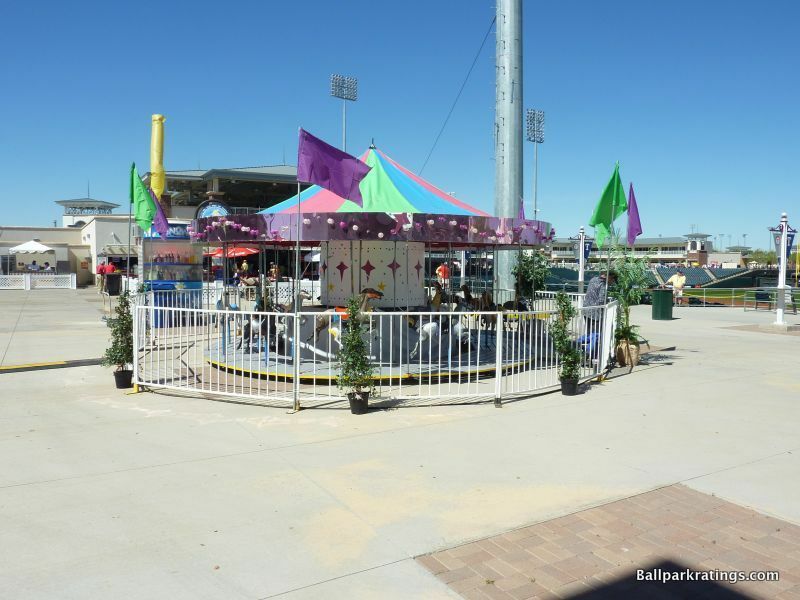 The following parks do not have any kid-friendly features: Maryvale Baseball Park (Milwaukee Brewers), Tempe Diablo Stadium (Los Angeles Angels), and Surprise Stadium (Kansas City Royals and Texas Rangers). The latter is of particular disappointment, as they used to have a carousel which they have replaced with a team store. This carousel has been taken out of Surprise Stadium. It always looked more like a decorative element anyway. Like us on Facebook to get notifications about the latest articles, features, and reviews!